John Elliott Woolford, “Parisien Rapids.” Courtesy of the Toronto Public Library, TPL 902-1-10. 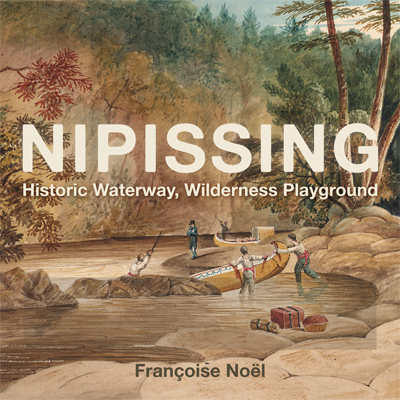 Nipissing: Historic Waterway, Wilderness Playground is now on the bookshelves and available online from Amazon and many others. Nipissing explores the history of the Nipissing Passageway, from Mattawa to Georgian Bay, beginning with Champlain’s voyage in 1615. The efforts to build the Georgian Bay Ship Canal and the mid-19th-century promotional efforts by railways to market the area as a “sportsman’s paradise” are discussed, and sportsmen’s literature is cited to demonstrate early environmental conditions and the importance of local guides. The rise of local outfitters and the early appearance of cottagers in the French River are also outlined as well as early 20th-century efforts by Ontario to build roads and lure American motorists to the area. Quintland, named for the famed Dionne Quintuplets, as a “pilgrimage” site and resort expansion through to the post-war recovery are investigated and a look at the Nipissing area today reveals that, for many, it remains a wilderness playground.